The older I get, the faster the time passes by. Without my permission, I find myself hovering on the verge of becoming a senior citizen, whatever that means. Totally unbelievable. 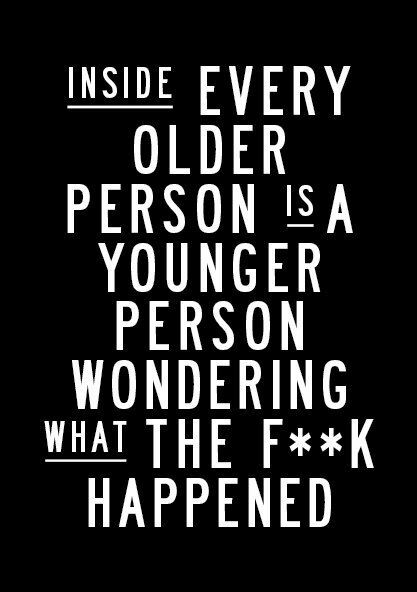 Part of the problem with the aging process is that none of us feel any older inside. Excuse my language but that’s the truth of the matter. 4. Night vision becomes a challenge. We see halos around lights and can’t make out the details of signs as well as in daylight. 5. Energy levels may decrease. Or else we become smarter about doing the same with less output. 6. Forty year olds seems very young. 7. Twenty year olds seem like children. 8. Grandchildren become a focus, unless there aren’t any. 9. Retirement is constantly on your mind if you’re doing work that you don’t love. 11. You have less patience and tolerace for a whole bunch of things. You don’t notice any of these changes, you know you’re always right, that change is stupid and scary and worthless and that nobody but your generation knows much of anything worthwhile. If we’re lucky, we get to experience aging. Until Alzheimer’s hit, my mother was enjoying her life as a senior in a condo with other seniors. It was the best time of her life. She never used a cell phone and didn’t own a computer but her life was great. Aging for the boomers is quite different than it was for my mom’s generation. We expect more from our bodies and minds. We assume we’ll be able to function until the end of our long lives, all the while knowing that Dementia is incapacitating 1/8 of us. We know that social changes are going to happen steadily and consistently. Future technology can’t be imagined by most of us, but we strive to keep up because we’re afraid of falling too far behind now. We aren’t retiring quite as early as our parents’ generation, because we’re healthier and more vital. And we’ll live longer. We have seen lots of the world and want to see more of it. Nobody knows how it’s going to look for us to be 80 or 90, but we know it’s coming. It will arrive faster than any of us expects. One day you’ll wake up and look around and say “Oh my goodness, I’ve become old when I wasn’t looking”. Louise, it’s so true that as we age, our bodies are more symptomatic. That’s why it’s more important than ever to take good care of ourselves in our 30’s, 40’s and beyond… so that we can age gracefully and comfortably. I love that quote! I definitely feel that way. Especially when I’m around people who are significantly younger than me. In my mind, I feel like a contemporary, but they clearly see me as someone “much older.” Here’s to fighting age, every step of the way and continuing to live as sassy chicks forever. yes, I’ve asked myself the same question many times. WTH?